Piaggio is a little late to the party. Two years ago, they first presented the electric concept of a Vespa at the EICMA and announced a plan to begin production halfway through 2017. A year later, the ball is finally rolling: Starting in September, the Tuscany-based company will be producing the electric scooters in their Pontedera factory. The price for the 50cc version of the Vespa stands at 4,000 euros for now, which makes sense with Piaggio’s accompanying statement that their vehicle was aimed at the luxury motorised scooter market. 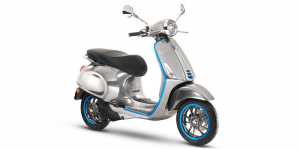 The E-Vespa can be ordered online as of October. Deliveries are expected to begin at the end of October, with a roll-out taking place in several steps across Europe, which will continue to Asia and America in 2019. The first technical details were revealed in the introduction of the serial version last November. The electric motor has a continuous performance of 2 kW, a peak performance of 4 kW and 200 Nm torque. The lithium-ion battery mounted under the seat allows for a range up to 100 km, according to the KERS system. The hybrid version has a range of 200 km, 50 of which on battery alone. Charging times for the e-Vespa are around four hours. The battery is said to be able to survive 1,000 charging cycles, which the manufacturers estimate will last about 10 years. It can be charged at a regular household electric outlet.